Best Seller - Over 5000 Sold! Please Pre-program for Moderate/Severe high frequency hearing loss. The Best Ear Basic is an open-fit hearing aid. Since the circuitry is on the outside of the hearing aid, this model is for people with moderate to severe high-frequency hearing loss. The Open fit style is discreet and not easily visible. There are no ear molds, making the hearing aid lightweight without giving your ear a stuffed feeling. By the push of a button, you can change between 4 memories for a quieter setting, a noisy setting, while using the telephone, and when listening to music. This hearing aid will allow you to hear the sounds you have been missing. There is an easy-to-use volume control button located on the hearing aid for easy access. A 12-band processor will increase specific frequencies where you need more volume, without affecting the areas you need less volume. The hearing aid has 4 channels. Channels help control the intensity, limiting the sound at a certain peak. The Best Ear Basic Hearing Aid is Affordable and comes standard with a 1Year Iron Clad Warranty and 90 day full 100% Money Back Satisfaction Guarantee. 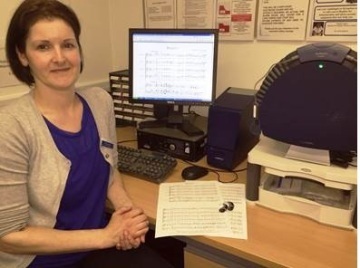 This is the first time hearing test data has been used alongside social psychological data to create a systematic exploration into how hearing aids affect music listening behaviours. Improved access to music using hearing aids will benefit people of all ages, facilitating music education for deaf children and young people, music listening and performance in adulthood, and continued musical engagement into old age. This research is very much needed. Music and the Deaf often receives emails from musicians or parents of musical children who are frustrated with their hearing aids. Music forms a very important part of their lives – anything that might help improve their enjoyment of it, whether as listeners or performers, is to be welcomed. Dr Greasley is conducting interviews with hearing aid users and will also lead a large-scale national online survey. Dr Robert Fulford, a Post-doctoral Research Fellow at the University, is also working on the three year project, which has been awarded funding worth £247,295 from the Arts and Humanities Research Council. Drs Greasley, Crook and Fulford are joined by an advisory panel consisting of experts in auditory processing, digital signal processing, hearing aid fitting, hearing therapy and deaf education. Their findings will benefit hearing aid users and people with all levels of deafness, both in the UK and internationally, through open access content on the project website and forum.